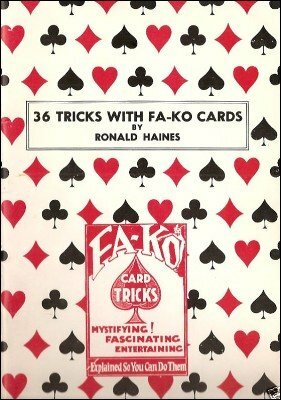 Ronald Haines, through his business Haines House of Cards, sold a deck of gaffed cards called 'Fa-Ko' cards. This deck is not anymore available but perhaps you can find it second hand. However, now that it is very easy to make your own playing cards (see DIY Playing Cards) this collection has gained in value. The gimmicked cards required are listed at the beginning of each effect. The regular cards needed must be removed from a regular matching pack. This FA-KO Pack is not a toy for children, nor is it a collection of "self-working" tricks. It is a collection of professional secrets, and the necessary prepared or gimmicked cards for doing the tricks and effects explained. The collection is of great value to the man who knows magic, for the tricks have been tried and tested over the years. Some of the most astounding effects in the programs of today's magicians and mentalists are obtained by using gimmicked cards — in some instances whole packs of gimmicked cards! So PLEASE — keep the secrets you learn — treat these effects with the dignity they deserve! There is much, MUCH more to being a magician than knowing the secrets of tricks, and as we said before, these tricks are definitely not "self-working." There is much that YOU have to do! Cards must be added to your regular pack, and after the effect, secretly removed. Or, one pack must be "switched" for another. The original FA-KO Pack advocated doing a routine of tricks with the gimmicked cards. We feel that it would be much better to use them as individual tricks — the little "miracles" possible by the use of gimmicked cards will add greatly to the other tricks in your routine, and serve to increase the mystery. Read the directions carefully, and practice the tricks until you know exactly what to do. Do not give them a public showing until you ARE SURE you know what to do! And do not be content to merely "do tricks." Always try to entertain people with your magic — entertainment is your ONLY EXCUSE for being a magician and demanding the attention of others. People want entertainment far more than puzzles they can't solve — see that they get a little FUN out of your tricks — it will make fooling them SO much easier — and they will feel it worth their while to watch your magic! Edited by John Braun. 21 illustrations.